Lokpal Bill is passed amidst protests. BJP accepts for the discussion that to be carried on December 27th. The Lokpal Bill passed has maintained CBI's independence as of now and quoted Lokpal as a cognizant agent, not an investigative agent for the complaints made by the public. 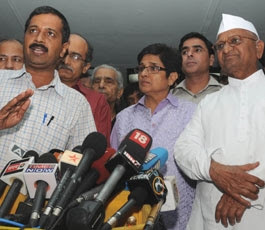 One consideration give to Team Anna's proposal is Group A,B,C,D cadre Govt. employees will come under Lokpal, that too with an exemption that C & D cadre come under Central Vigilance. Lokpal Bill also excempted PM from its clutches in matters of External Affairs, National Security, Atomic Energy as these are sensitive arenas. These things we already knew and having in our constitution. Then what for we need such a new constitutional body like Lokpal? Expenses spent towards this task is a waste. We are already fed up with these constitutional bodies which are not at all functioning efficiently. Same thing happens in Aadhaar Card initiative also. Govt. acts in a haste manner without enough feasibility study. BJP has gained some popularity by supporting this cause. But at last the Govt. wins. The war was almost over. Our Governance, whether Cong. or BJP, is very popular for passing Bills and resolutions, making Amendments to suppress the agitators/protesters. Team Anna is going for another fast opposing the proposed bill. That being on December 27th, the same day the tabled bill is put for discussion. The chosen maidhan for fasting for three days is in Mumbai. Great drama is going on. We, the people are the witnesses. 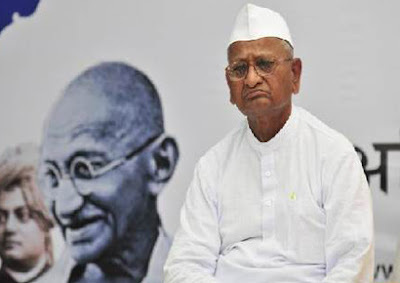 Does Anna not know the power play of our corrupted Govt.? When Anna first started his fast, the Govt. thought that is just another routine agitation. When it spearheaded by the people, it just showed its power by lifting Anna and others from the ground and jailed them. When the issue went out of hands, it decided to scrutinize the Team Anna members. It beats around the bush cleverly. When they are busy tackling the problems, the Govt. act in a vigorous way to pass the bill of its own. and somehow succeeded. When Team Anna came to their senses, all are over. 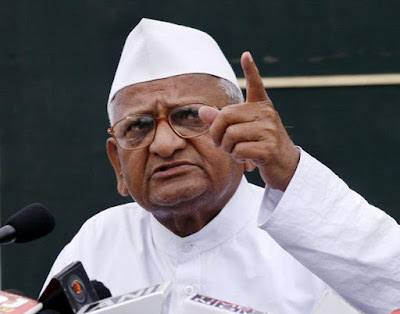 Team Anna, now got in the grab of Govt., unable to do anything. If they fast again, the Govt. will make some eyewash amendments in the already tabled bill and passes it as it wishes. BJP acts and reacts openly in a foolish way. But Congress always play games cunningly. All knew how it acted in 2G scam punishing only its ally and pocketing most of the money silently. They have experience in these matters. They are ruling us from post-independence era. They know the strength and weakness of our people and plays the 'Secularism' trump card intelligently. Posing Anna as another Gandhi wont help us this time. Where is the need for another Gandhi?....Are we slaves to another province?... We are slaves to our own....We are in need of good governance and a better constitution. Not Gandhi this time. Yesterday I went to a Govt. Office housed inside the Collectorate Complex, Coimbatore for getting a certificate signed. As I wait, the person before me asked the officer-in-charge about the charges for the signature. He said it is Rs. 105. This man gave Rs. 500 and the officer just grabbed it in a second and thrust it in his pocket. No time for me to Click...Who is in fault? Changing people's mentality of accepting anything that comes free. Changing people's mentality of thrusting for doing things in a faster way. Give incentives to the employees in Govt. sector who work hard for good governance. Lokpal bill has to be passed and to be include unconditionally priminister and CBI. Madama Gandhi's supporters talking about democracy it feel like a joke only. In many Tv programmes, Madama's supporters said that we are ruling India we ll decide. It shows that its dictatorship voices of supporters. Actually in India trhere is no democracy, they talking with democracy and doing like a dictatorship basis. PM has no time to discuss about anything he only interested to how to sell Indian Public sector, Indian soil and India to Corporates and Western 'countries. So we have to ( Thats our final time now) to protest and throw Italian Madama's rule from India. If you fail, withing 10 years India will be under Corporates and westerners only. So support Anna and take and use this opportunity to bring real democracy.